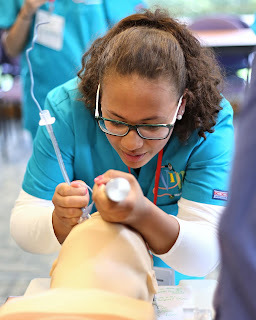 During the June 12 Level 1 Medical Camp, Mackenzie Hoover learns how to intubate a patient. FauquierHealth is celebrating its 11th year of offering summer Medical Camps for middle and high school students. The camps provide students 14 to 18 years old with hands-on experience and insight into possible medical careers, drawing children from around the East Coast. Some medical camp graduates are now in medical school, nursing school or exploring other healthcare professions. 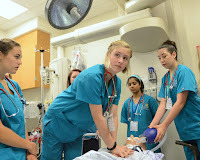 The camps offer two levels of hands-on activities during which students learn and practice skills essential to patient care. Acceptance into the camp program is competitive, and applications are available every year in early February. This summer, 115 students will be participating. First-time campers attend the Level 1 Medical Camp, learning skills like typing blood in the lab, how to intubate a patient, how to suture, starting an IV, mixing medications in the pharmacy, and seeing how X-rays are performed. Students participate in a mock code in the Emergency Department, learn how to triage patients, take blood pressures and harvest a cornea from a human eye. Level 2 Medical Camp activities include all of the following on the first day: applying a cast to a partner’s arm (and cutting the cast off using the cast saw); placing internal sutures and closing skin incisions with staples, and extricating a patient from a vehicle using a cervical collar and backboard. On the second day, students learn to do injections and blood draws, in addition to other learning activities. Students must have participated in a Level 1 camp in a prior year to be eligible for the Level 2 camp. The first Level 2 camp will be July 10 and 11; a second session will be held July 17 and 18.